When exploring new employment opportunities, changing jobs or looking for job promotions, all of us would hope that the primary focus of our worth as an employee would be based on strengths, qualifications and experience — not our breath. Often times, however, when someone is battling with offensive breath, the focus unfortunately does shift to the problem, and this can even weigh into an interviewer’s consideration when hiring, getting a promotion, or even working closely with others. With chronic bad breath, co-workers already know of your problem even if no one tells them outright. If you have bad breath, its effects are probably hurting your job without you even knowing it. Most people don’t talk about bad breath because it is considered a personal problem and difficult to broach with a colleague. The natural tendency is simply to react to it. First impressions are big, especially when it comes to the workplace. What many people fail to realize is that chronic bad breath, especially when the problem has gone on for many years, will never be completely eliminated with a treatment of breath products — no matter how effective they claim to be. The simple reason is that these products are only temporarily treating the external symptom, not the root cause of the problem. I have had a serious breath problem for many years. I made it a point to sit a bit further away from people than normal and I avoided the “water cooler” gatherings at work. For a long time I was able to use mouthwash, mints, and gums to cover it up, or at least I thought. A few days ago, I was in a meeting of senior staff at the tech company where I work. I was to make a presentation to the bosses. I sat down at the conference table and started to chat with the guy next to me before the meeting started. I noticed him pull back a bit and then a bit more. After my presentation, the meeting was over and everyone left. The person I was sitting next to left quickly. I went back to my area at the table to collect my things and there was a small sticky note that said “Your breath is obnoxious”. Unfortunately, I was sitting next to an executive vice-president in charge of customer relations. My heart sank into the floor and I had to fight back the tears. I desperately need help. If bad breath is restricting you from fulfilling your career potential, can you afford not to get it cured? 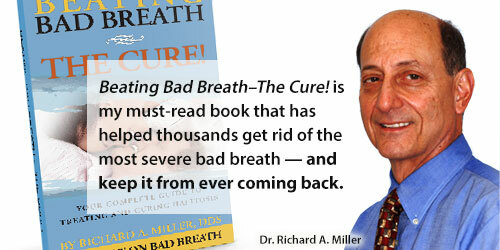 You owe it to yourself to examine our complete bad breath Total Cure which is only found at the National Breath Center. 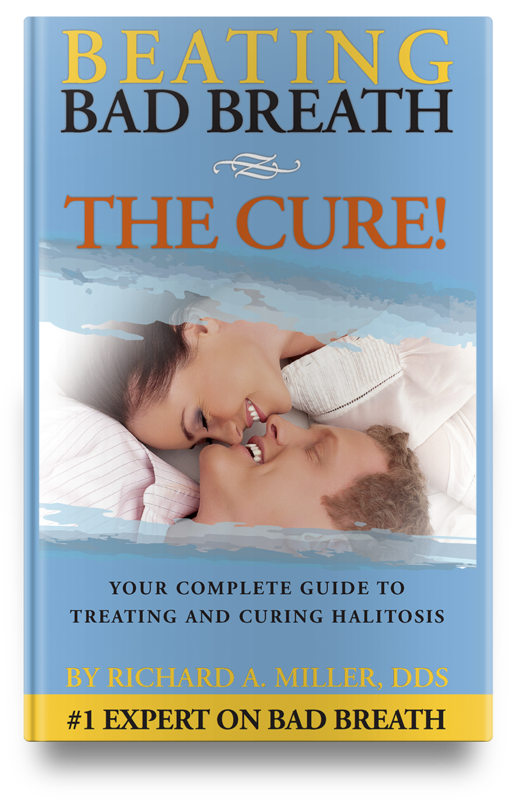 This bad breath cure was first introduced by Dr. Richard A. Miller in 1993 and since then has given thousands of people total freedom from the embarrassment and humiliation that bad breath causes. The National Breath Center backs its Total Cure treatment with a money-back guarantee.